The Statistics web module, similar to the one from the Wholesale Trading Platform interface is now part of the enduser’s web interface VSPortal. User can see various parameters measuring the traffic quality such as ASR, ACD and PDD. It also shows the longest, shortest and median calls duration as well as the stats measures of the PDD for selected period of traffic. It is very useful to have all those crucial information at a glance. 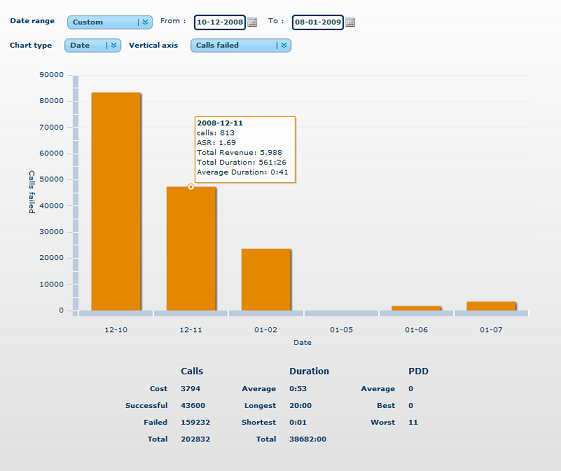 In addition a user can see the number of total successful calls, total failed calls, total duration and total cost for selected period. The graph is divided on days and when we hover mouse over given column it will show statistics from this day only. 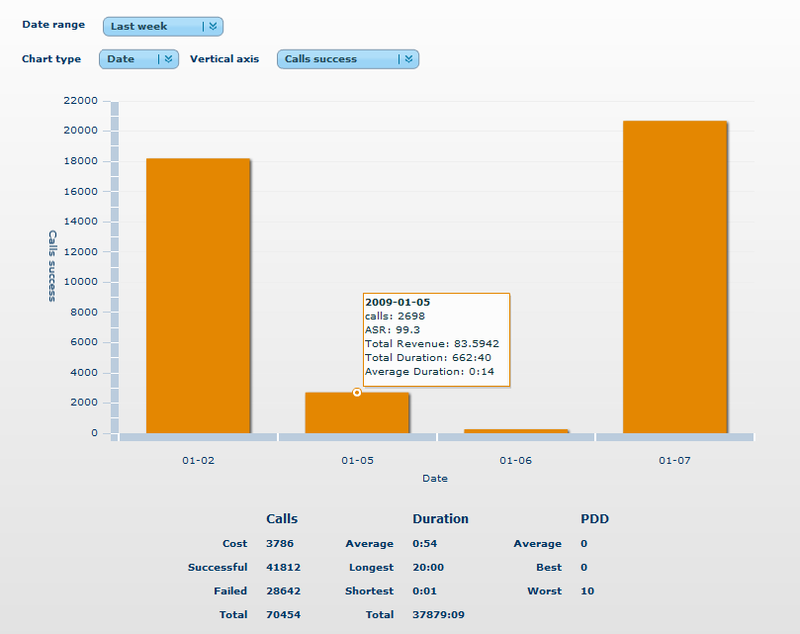 User can select what will be shown on the X axis, whether failed or successful calls. 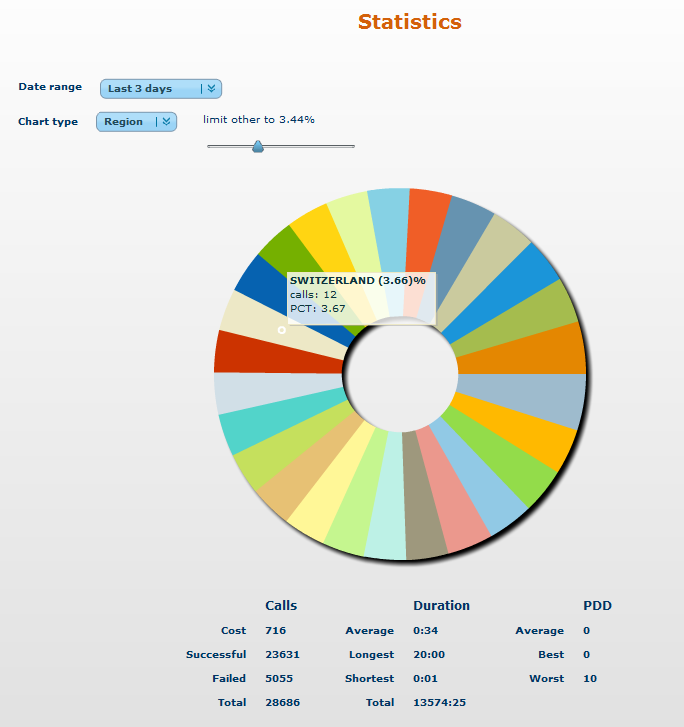 Another interesting option is a pie chart showing calls divided on regions (according to the rate sheet breakouts). Just one look and you can see which destination gets the most of your traffic and which the least. You can also use a resolution filter to limit the destinations in the chart to only those that exceeds certain volume, for example more than 5% of total traffic. When you hover mouse over the pie you will see the details of each region. The Statistics menu is included in the general VSPortal release and can be enabled in the Portal Admin section. This functionality can be used by each type of voipswitch clients, surely it will be the most welcome by the wholesale clients sending significant traffic to voipswitch.